Frigidaire FAFS4474LW Affinity White Front-Load Washer 4.4 Cu. Ft. 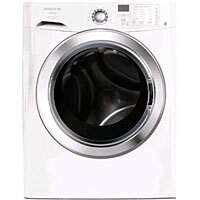 The Frigidaire FAFS4474LW Affinity White Front-Load Washer 4.4 Cu. Ft. Capacity is an energy saving washer that allows users to cut back on water and electricity expense without compromising the quality of the wash. Its Ready Steam and Stain Pretreat features makes it possible to remove even the toughest stains found on fabric. At the same time, multiple cycles allow for great versatility in washing, partnered by various features aimed to make use more convenient for consumers. This high quality washer comes in a sleek and stylish model that would easily fit in with most contemporary decors. This Ultra Capacity washer can accomodate bigger loads than most of its contemporaries. Save up to thirty percent of water and energy with the help of the Ready Clean feature. Remove even the toughest stains with the combined power of Ready Steam and Stain Pretreat. Specialty Cycles makes it possible to wash the stains of various fabrics including teddy bears. Cut back on laundry time with a combination of time saving features including TimeWise and Quick Sanitize. Schedule exactly when to wash clothes for hours in advance with the Delay Start feature. Unlike other models, this Frigidaire unit comes with the SilentDesign feature for noiseless washing everytime. A NSF Certified unit, it can easily get rid of bacteria and allergens usually stuck in fabric. Add-A-Garment feature makes it possible to add more clothes in the wash even when the machine is currently on cycle. Eliminate the need to choose settings by activating the Save your Settings feature. Stay fresh door seal keeps clothes smelling good even after being in the washer for a long time. Controls are conveniently located at the front for easy use. Stylish design makes the unit a great appliance to have around the house. The design also fits any type of laundry area interior. Capable of accomodating large loads, this washer model is ideal for large households. This energy efficient machine cuts back up to thirty percent in water and energy use. SilentDesign feature makes it possible to wash clothes at night without waking the neighbors. Ensure thorough cleaning with Sanitize cycles that get rid not only of bacteria but also allergens from the fabric. Multi-tasking is made possible using the Delay Start option that may be programmed to operate for up to fourteen hours in advance. Conveniently add more clothes in the wash while the machine operate with its Add-A-Garment function. Soak and steam even the toughest stains away for a high quality clean every time. Keep the clothes smelling fresh with the special door seal that keeps odors out. Legible controls located at the front are easy to handle. Stylish design and color makes this model easy to fit in with any decor. Save the last used settings and apply it again for the next wash to save up on laundry time. Multiple cycles makes it possible to wash a wide range of clothes and fabric including fragile material to tough teddy bears. The model doesn't come with the self cleaning lint filter. Its huge capacity makes it ideal for small families. Comments for Frigidaire FAFS4474LW Affinity White Front-Load Washer 4.4 Cu. Ft.
we just brought the washer machine, test it and everything works fine except when it come to spin, the spinning was so powerful and the machine was at least 1/2 feet away from it's original location. Any idea of how to stop it from moving out of the spot while it is spinning? Thanks.